I could say “if only Suzu had left in more of a hurry”, but “if onlys” are at the very core of Steins;Gate. The future is the product of countless “if onlys” that were combined just so. Besides, there’s an element of inevitability, such that Suzu’s departure was meant to be delayed by Mayuri, and Mayuri was meant to know everything everyone else knows. 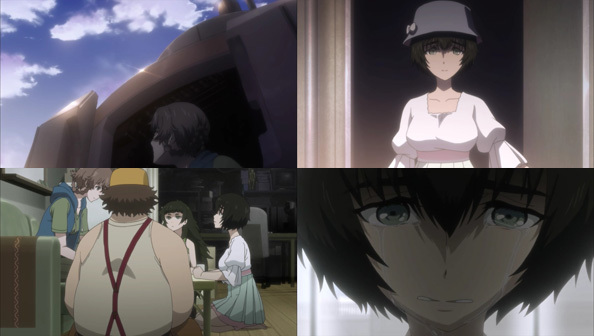 Suzu, Daru, and Maho tell her what they know, and it confirms what she suspected: Rintarou is in this state because he lost Kurisu, whom he loved. 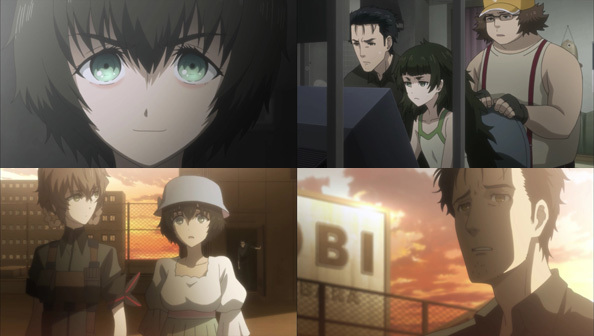 Mayuri exclaims that she loves Okarin every bit as much as Kurisu did if not more, but loved Hououin Kyouma even more than that, even though that persona has vanished, along with any joy in Rintarou’s life. Because she loves him so much, Mayuri cannot stand by and allow him to remain so sad. So she decides not to stop Suzuha, but to join her on her trip back to August 21 of last year, in hopes they can both find the Steins Gate World Line. Rintarou races to the rooftop to plead with Mayuri not to go, but she’s determined to, as she poetically puts it, “clear away the clouds that loom over his sky”. By having to deal with both Mayuri and Rintarou (the latter of whom she shoots, grazing his leg). Suzuha wastes a lot of time she should be using to get out of 2011 while she still can. She even leaves Mayuri alone on the rooftop as she takes Rintarou aside to patch him up. The cell network blackout should have been a sign—a very ominous sign—that her window for escaping to the past was becoming smaller with every passing second. Earlier in the lab, Daru, Rintarou and Maho find messages from AmaKurisu on @channel, and Maho learns that the system was hacked and Kurisu’s memory data stolen. All of the actions and inactions, observations and failures to observe, culminate in a D-Mail being sent to Suzuha from 2025; the first of this 0 arc. It’s from the future Daru, but from a slightly different world line than the one she left. The lines diverged when Suzuha and Mayuri decided to use the time machine. But they never get to actually use it. 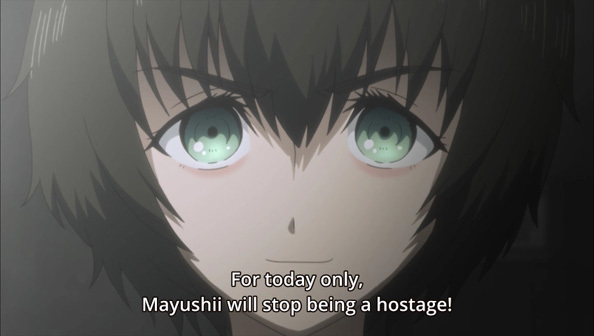 Instead, Mayuri is taken hostage (making her announcement back in the lab heart-breakingly prescient) and the entire rooftop is swarming with soldiers; I’m guessing the Americans. They surround Suzuha and force her to surrender, but she has one more ace up her sleeve in the form of a knife hidden in the time machine. 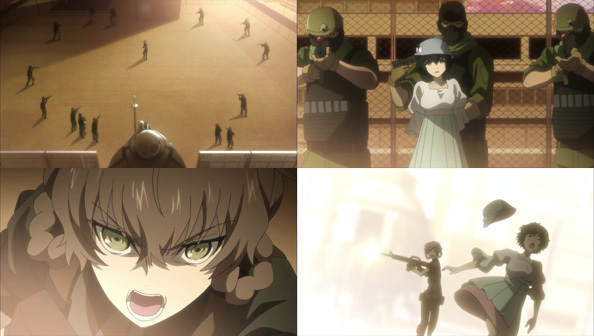 Suzuha goes on a mini-rampage, but there are too many soldiers to take out, and in the mean time Mayuri is badly exposed. Just steps away from the safety of the stairs, she’s shot in the head and falls lifelessly to the ground. At first I thought it was just a stray bullet—there were so many—but the headshot is the work of Mayuri’s own future daughter Kagari, AKA K2605. Never mind “if onlys”—I can’t see how this could have possibly gone worse.